KeyMe, a security technology company based in New York, wanted to revolutionize the locksmith industry by offering self-service kiosks that allow you to scan your key, save it to the cloud and then print a spare anytime in the future from any kiosk anywhere in the world with just your fingerprint. How much does the KeyMe Kiosk cost? 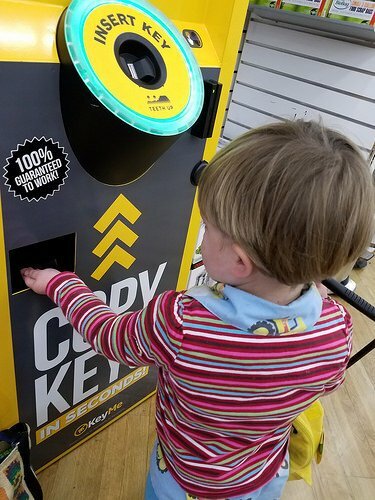 The costs of the KeyMe Kiosk, like a locksmith, greatly depends on the type of key you need to have copied, with a simple brass key costing about $2.99, whereas a non-transponder key can start at $19.99, for example. Refer to our table below for the prices you should budget for if you plan on using the kiosk. How does the KeyMe Kiosk work? According to the company, the kiosk works in the following way: You insert your key into the kiosk, follow the prompts on the screen and then, a duplicate key is produced on the spot, all while saving your key to the cloud with your fingerprint, which, as mentioned, allows you to print your key anytime you need another spare key. Aside from the kiosk, the company also allows you to mail-order hundreds of vehicles and high-security keys, all for a “fraction” of the cost of what a dealership would charge you. The kiosk does offer several design options for your spare key, ranging from a simple brass key to multiple decorative options, including NFL, NBA and MLB themes, to name a few. For a full catalog of the decorative options available in your area, refer to this link to see the most popular options. Most of the keys can be copied on the spot; however, for some, such as key fobs, the company will have to mail the key to your home, which, according to the company, can take two to five days, depending on when they receive your order. According to the official FAQ, the company supports hundreds of key types, including home, office, padlock, mailbox, Mul-T-Lock and some Medeco keys, in addition to multiple vehicle keys, ranging from cars, trucks and motorcycles to snowmobiles and even boats. The kiosk is able to copy any key with a “do not duplicate” written on it, with the exception of any kiosk located within the Los Angeles city limits, due to a city ordinance. If your key doesn’t work, the company does offer a “100% Satisfaction Guarantee,” which promises to get you a working key. To find a KeyMe Kiosk near you, you can see a full list of locations here. Promo codes are commonly available, especially if you’re a first-time user. Be sure to check out the website to see if you can save any money on your first key cut. For example, at the time of this publishing, they were offering a 25% off promotional code when you signed up for their email newsletter.